PC: What artists do you particularly admire? 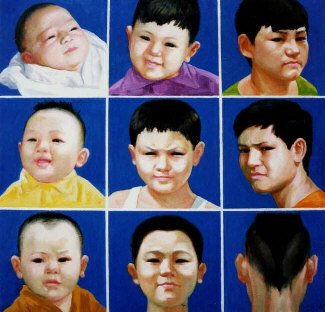 RG: Here I am not going to mention the Chinese artist. For Western artists, I admire Botticelli, Bruegel, Vermeer, Gauguin and Matisse. For American artists: Arshily Gorky, Miton Avery, Edward Hopper, Romore Bearden and Andy Warhol. PC: You’ve done a number of self-portraits. If I may, I’d like to ask a couple of questions about those. 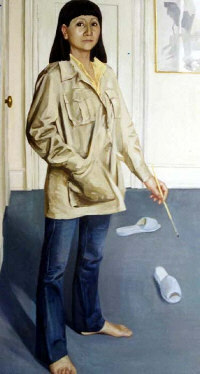 In the portrait in which you stand holding a brush, you’re barefoot. Were the slippers merely a convenient design element, or did you want to suggest something more by being barefoot and the placement of the slippers? RG: This portrait I did in 1983, at my apartment in Philadelphia. When I decided to do a fall figure painting, I don’t want to looks too serious and stiff. So I made myself a barefoot. Then the backgrounds were too plain, the two slippers were just about right in that space. It spontaneously happened. PC: Would you tell us about the two self-portraits Self Portrait and Self Portrait (2 pieces). The shapes/windows through which we see fragments of your face remind me of the traditional shapes of fans. Is this a coincidence? Would you talk about the choices you made in these two self-portraits? In the fragmented portrait, one seems to be a profile and the other a direct view, but from different distances. RG: This pair of Self-Portraits I did in my studio at Penn about early 1983. The inspiration came from a traditional Chinese format. In the traditional way, the inside of those six shapes were marble. The marble natural grains looked like the Chinese free-hand brush works. They had beautiful rhythms. This format was a common decoration in traditional Chinese house. In this pair of self-portraits, I chose put my head in both shapes, one was the front of my face, another was profile of my face (my profile has strong feature). 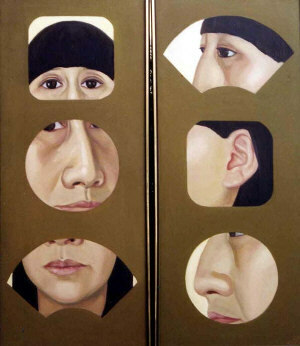 Each of the paintings divided my face into three sections, but each section was not directly connected. I wanted to make an illusion effect. PC: You have a painting of The Artist’s Son with a series of images of him at different ages. Did something specific happen that made you decide to paint that? How does he feel about the painting—and has that changed (is this recent?). You show the typical turning away of an adolescent from his parents, which can be painful for the parent, though necessary for the child. Did you have a kind of catharsis painting this? RG: This portrait I did in 1991. My son was just turned 18 years old, senior year at high school. He is my only child. When he was two years old, I had to leave him and went to Inner Mongolia. I could see him only once a year. In 1981, I came to the United States. After being separated from him for 4 years he came to the US too. To watch my own child grow up was a unique experience. I want to use a visual image to record his growth through a mother’s eye. On the right, top image, he was 12 years old and just arrived to the United States not any words of English. The school kids teased him a lot. He was angry, frustrating and fighting all the time. The middle image of the right line, he was 15 years old. He started to look in the mirror, combed his hair and to pay attention to girls. The bottom image of the right line, he was 18 years old. He cut his hair like a Punk by himself. I chose use his back of the head to symbolize he was grow up and started the independence. Also an important reason of this choice was to make the composition unusual. This painting belongs to my son. Now he is 33 years old, married and going to be a father soon. He loves this painting. PC: In The Beauty you put together nine oval partial portraits of women from many cultures. Would you tell us how you chose these images? Do you consider yourself a feminist? How do you define the term? RG: I borrowed one of the western traditional portrait formats—oval shape and put in nine images of parts of women’s bodies. It basically selects from the head to the body and to the feet. The reason I chose the images from ancient time to today, from the West to the East of the world was because people often only accept the existing concepts including the judgment of the beauty of women. These forces of habit are almost universal. Since the Paternal Line Society, The standards of women’s beauties ingratiate men. So women often have to reinforce and to abuse their bodies to meet those standards. I chose more extreme images and use realistic style to make a strong impression and ridiculous effect. 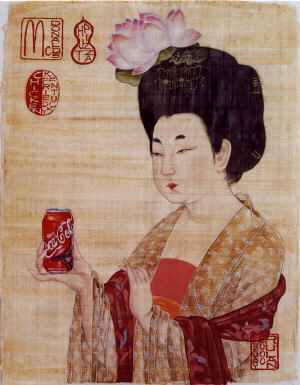 PC: Big Sister, and Eastern and Western You not only play with iconography—the artist’s seals becoming brand names of big western companies, your having signing the painting by a design made from your name--and adding a coca-cola can. 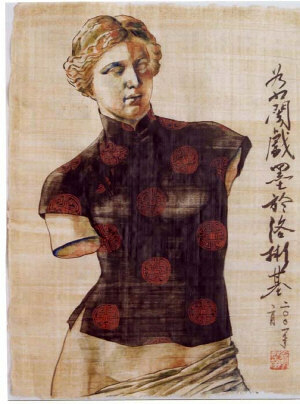 In Western the Venus de Milo is dressed in a Chinese-style blouse and down the side of the painting a line of calligraphy. Would you please translate and talk about your exploration of what it means to be feminine and the interplay of cultures? RG: These three paintings ideas came from the Globalizing. I lived in both the East and West and am sensitive to know the differences and changes. In 1994, I brought my husband back to Beijing to visit. In a very elegant, traditional Chinese style royal park, I saw a big Kentucky Fried Chicken set right in the center of the park. The fat, smiling Colonel was disturbing me. I didn’t know if I should laugh or cry. I did two paintings of The Big Sister. One is oil on canvas, another one is watercolor on silk. Each time I went back China to visit, I could see the local customs and native cultures so quickly disappeared. 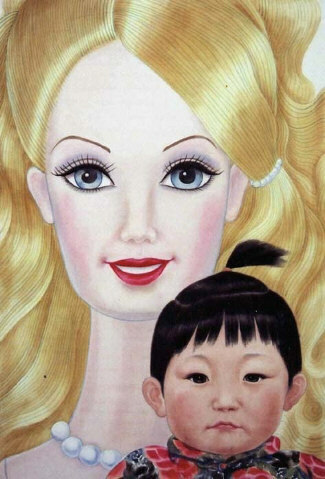 It was frightened and sad to imaging an innocent Chinese country girl would thinking her future looking just like a Barbie. Indeed, these are happening. 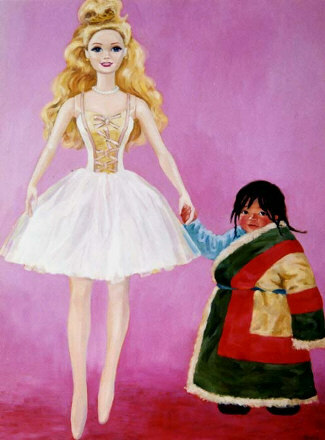 In the paintings of Western and Eastern, I used two famous figures. Venus is a Western Beauty God. On the Eastern painting, I borrowed a figure from a famous ancient Chinese scroll painting. It was painted a thousand years ago about the noble ladies in the Tang Dynasty (from 7th Century to 10th Century). On the original painting, the noble lady was holding a flower on her hand. In Traditional Chinese Painting, the stamps and calligraphies were always part of the painting. I put the English into the Chinese stamp format. On the Western painting, I wrote Chinese calligraphy, it was my signature and date and place where I did this painting. I want to show the two cultures have very different concepts and features. When they adopt each other, often it comes out in the odd way. PC: You’ve done a number of murals. How is this experience different for you than working on canvas? 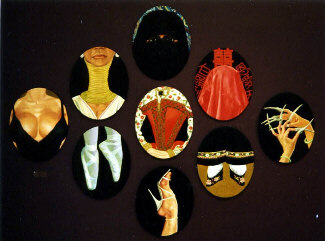 As some of these are works in private spaces (homes, airplanes), how do you feel when you leave them behind? RG: I am always excited to do murals because of the huge sizes. When I started this commission of a mural, I didn’t make the rough sketch. I designed every thing in my mind. Then followed the inspiration to fill out the spaces. This was a Chinese way to approach artwork. This mansion had a 14-foot-high ceiling, and about 700-square-foot size of the dinning room. This family collected the China Trade Antiques, so I created a scene of 19th Century of Guangzhou City where the China Trade took place. I did many activities and figures with details. When I finished this room of mural, the owner was very happy to see the moving rhythm and felt it bought the history to live. The most challenging was the intense labor involved. In their living room, the ceiling had over 100 square wooden panels. I painted every one of them by using a stencil. The working position was very difficult. It took me almost a year to finish it (you could see the mural pictures on my website). When the client is satisfied, I receive lot of comments on my work. That was the best part for me of a commission work. PC: How do you use photography in your painting? RG: My Chinese training emphasizes watching and memorizing from the nature, then in the studio to summarize and create. I do most silk painting in this way. When I do oil painting, I like to approach directly from life. Only in a certain condition, do I use a photo as a reference, but never copy from the photo. PC: Your travels become subjects in your paintings. Do you use a diary as well as photography in your painting? RG: When I travel, I always carry a sketchbook with me. Most of the time I would do a quick watercolor sketch to catch a fresh impression in that moment. Recently I printed my sketches as 2007 calendar. You could see on my website. PC: Thank you for taking the time to answer all these—and now, one more question, have I forgotten to ask something important? One more…I’ve been trying to place the transformation in “Eastern”, but I can’t. I recognize a lotus in the woman’s hair, but what’s the source? Thanks. RG: I mentioned before, on the painting Eastern, the figure was a Tang Dynasty noble lady. The Lotus in her hair was a fresh lotus flower. At that period, the fashion was the chubby body, the high hair and the eyebrows painted short and thick way above the eyes. Since then, China has been through so many dynasties. That fashion was long gone. At that period, that fashion was transmitted to Japan and became their national fashion until today.